What is a Cruise Really Like? If you are thinking of going on a cruise, then you are considering one of the most cost effective and easiest ways of traveling available. But are they the right vacation for you? If you are thinking of going on a cruise, then you are considering one of the most cost effective and easiest ways of traveling available. No other means of travel can you give you as much bang for your buck as a cruise. At least three times a day you’ll be given access to more quality food than you would eat over 24 hours back in the real world. Pick the right itinerary and you might get to see more countries on a single cruise than you would in year’s worth of plane travel. Cruises aren’t for everyone though, so read this article for some factors to consider on whether a cruise is the right vacation. The Cruise: Multiple country itineraries, adventurous excursions, gourmet dining, 360 degree ocean views and poolside relaxing. The cruise has a habit of making an addict out of many who venture upon it. However, here are a few things to consider, not necessarily to talk you out of cruising, but to at least temper your expectations. As mentioned, going on a cruise is one of the most cost effective ways of travelling, particularly when it comes to seeing a different country. No longer is cruising a past time of the elite. If you’re picturing a deck full of people in three piece suits eating caviar, think again. The low price means people from all walks of life, from all over the world, will board and rub shoulders with you. It also allows big groups of friends and family to travel together, inadvertently dominating any room they are in. “Just eat. Eat whatever you want"
You’ve heard stories about the food on cruise ships. Well, that’s just the appetizer. You have no idea what having unrestricted access to unlimited delicious food will do to you and your fellow man. While embarking a mother yells at her children, “you better be ready for more food than you’ve ever seen in your life”. Later, a veteran cruiser at dinner looks to the ocean with a faraway look in his eye and says “Just eat. Eat whatever you want. If you think you might like something, just order it, and if it doesn’t taste good then send it back and order something else”. “The waiting staff”, he tells us, “have one purpose, to make you satisfied”. Comments like this and the plates and plates of amazing food soon takes its toll on even the most strong willed of us. Be prepared. Be prepared to feel like you and everyone else are on a farm being fattened for market. Be prepared to become a prisoner to your own imaginary obligation to get as much as you can. At times it feels disgusting - gloriously, indulgently and awesomely disgusting. A cruise can be a very relaxing experience if you take it easy. However, if you want a super relaxing vacation then it might be better to consider a more traditional resort or hotel based trip. There is so much to do on a cruise ship and at the ports that sometimes we try and do too much. Also, although cruise ships are big, the population exceeds that of many towns back on the mainland, so be prepared for crowded pools and long lines at peak times. The cruise was pretty cheap for what you get, but don’t be fooled that the spending stops there. You won’t have to buy any more food but there are plenty of other things to spend money on. Drinks can rack up the bills while on board. Also, shore excursions are usually very expensive. However, many give the opportunity for people to do once in a life time activities so it can be well worth it. Still keen for a cruise? If you are still keen for a cruise, then fantastic! For many people the high energy of all those activities and being surrounded by happy vacationers is the perfect holiday, not to mention the chance to extend the girth of their trouser belt. Keep things like the costs, and how busy the ship will be in mind and you’ll have a great time. We have cruised a bit, and will continue to do so. If you enjoy it, you REALLY enjoy it. I think the three we have booked right now will be numbers 42 - 44. Mostly, we DO just relax and enjoy being at sea, and don't tend to do a lot of overindulging. Apparently not a place for a diet. Thanks for your comment Arlene! Wow, seven cruises? That's awesome! I never went to any of those shopper's seminars, but it definitely seemed to be psyching people up to buy buy buy. I understand what you mean - a cruise is great when you want to see as much as you can as quickly as you can, but it only allows you to scratch the surface of a destination. I really thought I had left a comment here, but now I am here to read again and tell you that I am linking to this wonderful and insightful page on my beach wedding blog. 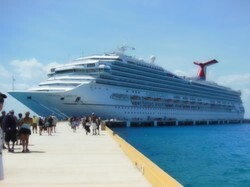 I think it will be very helpful in helping engaged couples to decide to cruise, or not to cruise! Thanks for sharing your story with honesty.